Ah… grilling season is finally here! Food from the grill is the ultimate summer treat. Whether it’s burgers, chicken or good old fashioned hot dogs, everything tastes better when it comes from the grill. It’s important to remember grilling safety tips though, to keep your family safe and avoid burns or fire damage to your home. Keep your grill away from your house. While it’s convenient to step out the back door and tend to the grill, if it’s too close to your home, the risk of fire damage that will require fire restoration is much more likely. A distance of two to four feet is advised. Keep your grill clean. It’s easy to forget about that little drip cup under the grill, but if that gets filled to overflowing with grease, there’s a much greater chance of a grease fire that can quickly get out of hand and cause fire damage to your home. Check your propane tank. Check the connections between the tank, hose, regulator and cylinder. Tighten anything that’s loose. If you smell gas, turn your grill off immediately. If you’ve checked all the connections and you’re still smelling gas, don’t use the grill again until it’s been professionally serviced to avoid fire damage. Take care with charcoal. Coals take a while to get going. Don’t let impatience cause you to try to speed up the process by squirting more lighter fluid on it. If you use an electric starter instead, make sure you’ve got it plugged into an extension cord that’s approved for outdoor use. Always let coals cool completely before disposing of them in a metal container. Smoldering coals are the perfect recipe for a fire that can cause fire and smoke damage to your home, garage or other structures on your property that will require a fire restoration company’s help. Never leave your grill unattended. When you’re entertaining, or just trying to keep an eye on the kids as you get dinner going, you may think it’s okay to let the grill warm up while you go do other things. 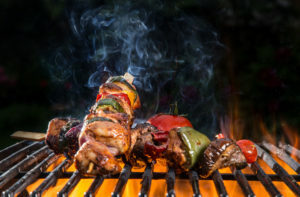 However, the most important time to attend to the grill is when you first start it up because that’s the time when issues like an over-full grease cup, gas leak or coal flare up will most likely occur. Obviously, you need to keep an eye on the little ones too and be sure they don’t play near the grill. While you’re reveling in the joys of cooking outside, stay mindful so that your grilling is memorable for all the right reasons! Home fires can happen in any season, but damage from a cookout can quickly put a damper on your summer fun. If, however, you do need the services of a professional fire and smoke damage restoration company, the team of certified and trained fire damage restoration experts at Hays + Sons is just a phone call away, 24 hours a day, 7 days a week, 365 days a year. With 140 employees, 120 vehicles, and eight separate locations, Hays + Sons has you covered.